Home » AMAZAING NEWS » HEALTH » KNOW HOW » Impact of erosion and mass wasting and how can we minimize it. Impact of erosion and mass wasting and how can we minimize it. In the process of erosion, the rocks break down and transfer to some other place. During erosion, not only the rocks are worn and torn but also the eroded stuff is transported to another place. In mass wasting, the earth stuff moves from higher to lower direction due to earth’s gravitational force. The irrigation system consists of muddy canal and small streams. It continuously faces erosion due to water. The fertile layer of soil present on the surface of earth faces gradual erosion and it flows along the water. There is very less plant life in such soil. The crop yield reduces. On mountains, pastures and shelters of wildlife, reduce in number. Due to erosion by water, huge amount of soil plies up at the bed of canals. As a result the water quantity in canal reduces. Due to a continuous transfer of soil material along with water, the base of dams is filled with mud. Thus, their capacity to store water reduces. After some time, water is not available for the irrigation system and for the production of electricity. Due to flow of soil and mud and land sliding in hilly areas, there is usually a loss of lives and economy. In 1985, after land sliding in Columbia a number of villages were buried under the soil debris. Such accidents usually occur in the northern area of Pakistan. In hilly areas, soil flow and land sliding are very common. Due to this the roads are blocked and inhabitants of hilly areas are disconnected from the rest of the world. It affects traffic system worst. · The impact of erosion and mass wasting can be minimized by taking the following measures. · It is necessary to plant trees on the banks of canals and streams in order to stop soil erosion by water. · The smooth level of agriculture land is necessary so that water does not take away the soil. By planting trees on banks of crop fields, the erosion and mass wasting can be reduced. · To reduce erosion and mass wasting on the surface of slopes, it is necessary to stop the cutting of tree on mountain slopes and plant more trees. · Settlements should be avoided in areas where there is danger of erosion and mass wasting. · Retaining walls should be done along the roads of hilly areas. · Dangerous slopes should be abolished. · Big buildings should not be built in hilly areas, especially where there is a sleeper slope. Destruction of the earths upper surface and the appearance of surface of underground parts is known as denudation. Weathering is a process in which rocks are broken down into small pieces. The volume of water increases on freezing. When water enters in minerals of the rock a chemical reaction takes place, known as hydrolysis. The rocks which have iron element are destroyed through the process of oxidation. The features of the earth's surface are cut through erosion process. The rock stuff moves downward areas due to gravitational force. It is known as mass wasting. 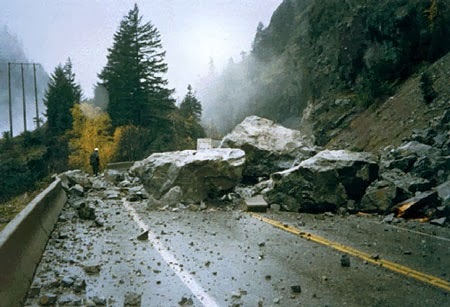 The sudden fall of rock material from high towards a down direction is known as land sliding. We can reduce the soil erosion by planting trees on the bank of canals and small streams.